(Bloomberg) -- U.S. Treasuries are shaping up to be this year’s hottest long trade, reversing their status as the big short for most of 2018. 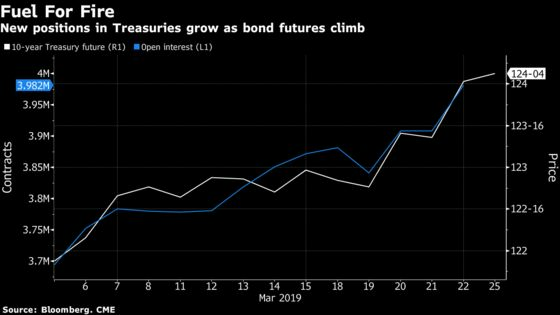 Open interest, a measure of outstanding positions across Treasury bond futures, jumped Friday while 10-year yields slid as investors piled into haven assets amid mounting concerns about the global growth outlook. Positions in total bond futures climbed $19 million per basis point, equivalent to $21.5 billion of 10-year cash bonds. 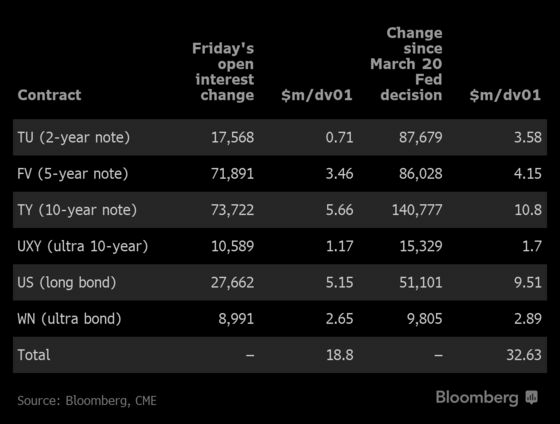 The rise in positions was more notable across the medium to longer-end, with five- and 10-year notes as well as long- and ultra-bond futures recording the biggest increase since June futures became the front month for traders, according to preliminary data from the CME Group. Hedge funds and other large speculators have also peeled back shorts in 10-year Treasury futures after holding record positions as recently as September, according to latest Commodity Futures Trading Commission data which run through March 19. Asset managers, on the other hand, are more bullish on the growth outlook and have been paring longs over the same period. Since the CFTC data, a dovish turn from the Federal Reserve and disappointing economic data from Europe have fueled further gains in Treasuries. Positions have been rising steadily, suggesting longs have been built and this will likely to be reflected in next week’s CFTC release.